Commissioned by the Duke of York, construction began on what was known then as York House. Princess Charlotte had died and HRH Frederick Augustus (1763 – 1827) was thinking he ought to have a palace now that he was heir to the throne. He once marched 10,000 men up a hill only to change his mind and order the lot back down. When York House scarcely had its foundation stone laid, the Duke sacked his architect, Robert Smirke, whose snide remark is noted in the the previous post.The Duke was as indecisive a builder as he was a military leader. Benjamin Dean Wyatt (1775 – 1825) was appointed to finish the job. He had been urged upon his royal patron by the Duchess of Rutland, who was remodelling her own home, Belvoir Castle (hmm, I sense a subject for a future post). BD Wyatt designed the house to be two story, with Palladium attributes such as a rusticated ground floor and a lofty piano nobile beneath a shallow pediment raised high by Grecian columns. I pause here briefly to note the Marquis had become Duke of Sutherland in 1833, by virtue of his marriage to the Sutherland heiress. Elizabeth Gordon (pictured below) became Countess of Sutherland when a mere baby. Both were notorious figures in a couple of ways. The couple was briefly imprisoned in France for attempting to aid Marie Antoinette’s escape. They were also responsible for some of the worst of the Highland clearances. The Marquis, appalled at the condition of his wife’s Highland tenants, decided they should be cleared and sent off to become fishermen. It did not go well, like so many well-meaning intentions great powers have for the good of the people. 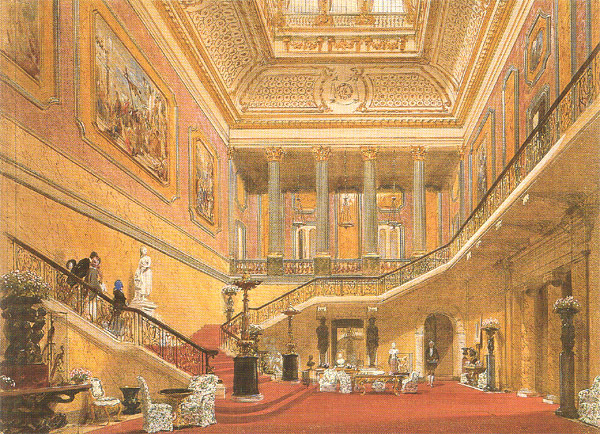 The 2nd Duke of Sutherland was primarily responsible for the fabulous interior of Stafford House. 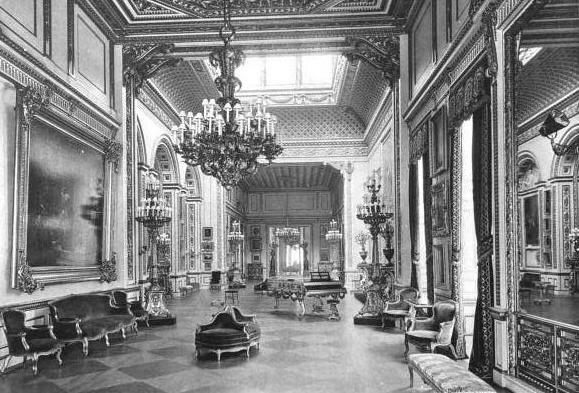 The state rooms were larger than those at Buckingham Palace. The central hall alone was 80 feet across and the stair rising 120 feet high. White marble Corinthian columns lined the walls. He added a third story to the house for all the nurseries, schoolrooms, nannies, nurses, tutors, governesses, et al for his eleven (11!) children. The decorative style has been described as Louis Quatorze — it could easily be termed rococo on steroids. The coffered and coved ceilings were heavily ornamented in the boiseriestyle and painted with lots gilding. 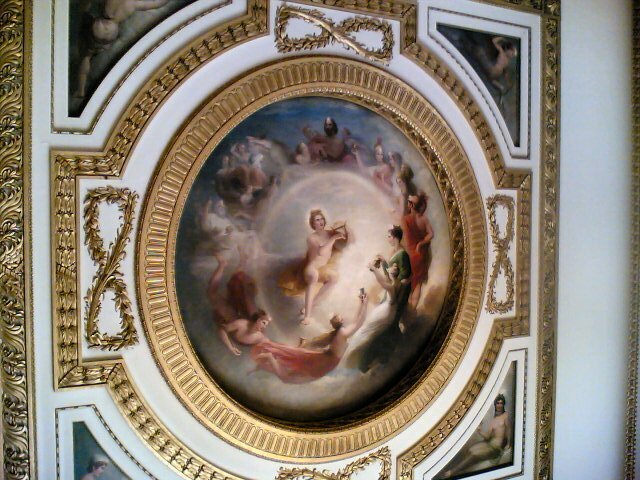 Below is one of several ornate ceilings in the house. As if that were not enough, the great Stafford collection of paintings was gathered together in the house, including art brought to England from plundered French aristocrats. Today, the palace is called Lancaster House. It serves as a government reception site. Better than being in a dustbin like some other houses we know.